FileBoss' viewer allows you to see the current image (as a thumbnail, full sized or zoomed) without interfering with your work. You can rename, copy, delete or perform any other file operation making these operations - and most importantly the decisions behind them - much easier. 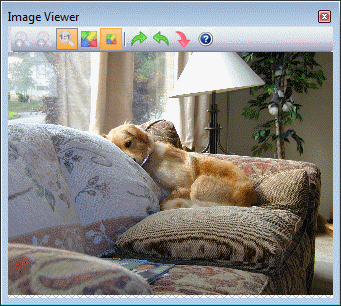 The image viewer can be docked anywhere just like the windows for the history windows, Drop Zones and Help Guide. To move it just click and drag its title bar. Double click the image viewer's title bar to undock it and make float on the desktop. The image view floats on top of all other FileBoss windows. Put it anywhere you want and get on with your work. And you can close and open the viewer simply by clicking its command button, pressing Shift+F5 or selecting View > Graphic Preview from the main menu. If you want you can quickly rotate images using the Arrow keys on the key pad while holding down the Alt key. And if you are doing many you can tell FileBoss to automatically save the changes when you move to a new picture so that you aren't constantly interrupted to confirm that the file should be saved. Naturally you can turn this option on and off. The Image view has two states: thumbnail and regular window. The thumbnail state shows the graphic sized to completely fit within the viewer. When the viewer is a regular window the graphic will be displayed normal size or zoomed to a size of your choice (see the graphic links below). To change between the two views simply double-click the Image viewer window.